Socket pulling grip is used to hold the conductors during the stringing operation. 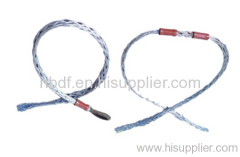 The product is specially braided from high strength galvanized steel wire. Socket pulling grip is used to hold the ACSR conductors in line stringing operation. Group of Socket pulling grips has been presented above, want more	Socket pulling grips and double head stocking, Please Contact Us.